For our second day in Taiwan, we had an early tour scheduled - "The Best of Taipei." Ray decided his feet hurt too much from yesterday's walking, so he stayed on the ship and I went without him. It has been raining all night and it continued to drizzle off and on all day. I understand yesterday's nice weather was unusual for this area. I'm very glad we took the tour to Yeliu Geopark yesterday, as it would not have been pleasant in the rain. The bus left about 8:45 am for the hour drive to Taipei. 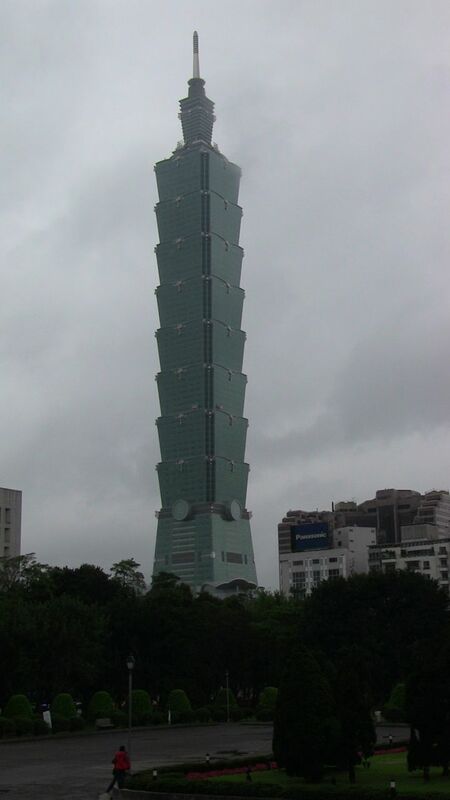 Taipei is the capital of Taiwan, so it is a much more modern city than Keelung. 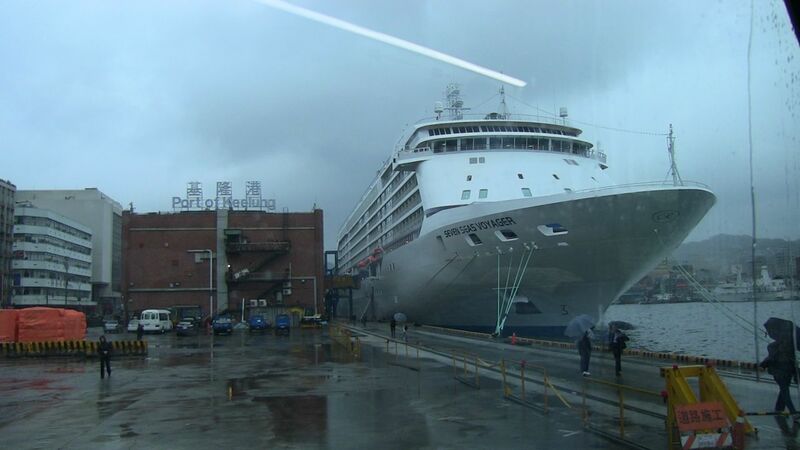 Many companies that have their factories in China have their headquarter buildings in Taipei. Our first stop was to the Martyr's Shrine. 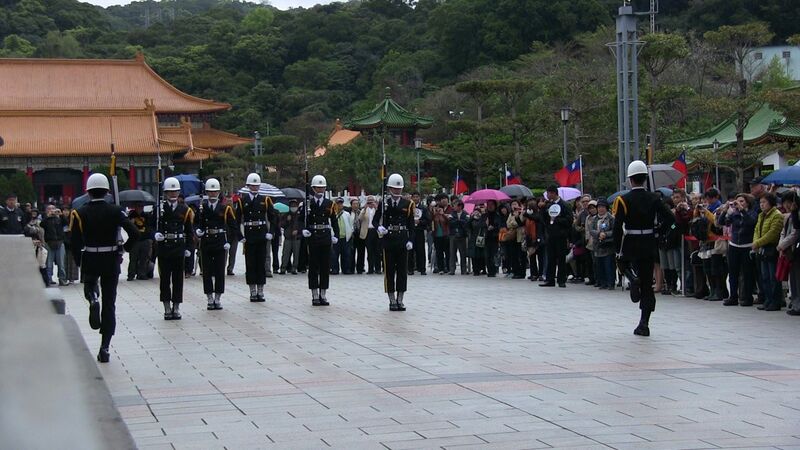 This is a monument dedicated to military, police, and firemen who have given their lives in service to Taiwan. There are 2 guards stationed at the outer gate and 2 at the inner gate. 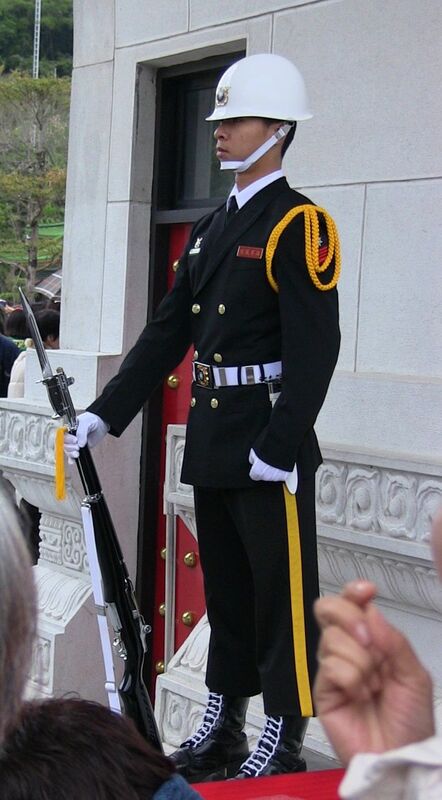 These guards are similar to other monument guards in that they are required to stay motionless for the hour they are on duty. Every hour there is a changing of the guard ceremony. The inner guard is changed on the hour and the outer guard is changes 15 minutes later. Our guide gave us the option of following him in to the inner area or staying by the outer gate. I decided to stay by the outer gate and was glad I did. As people moved in to watch the inner gate changing of the guard, I was able to establish myself in a great position to video the outer guard change, without anyone in my way. Our next stop was to the National Palace Museum. This is wonderful, modern museum containing priceless and beautiful objects from China's history, dating back thousands of years. Our guide was very good. He took us through highlights of the first 2 floors, not only showing us significant pottery and porcelain, but explaining the significance of the colors and designs. We only had an hour for exploring and 20 minutes in the gift shop, but it was filled well. This museum is considered on of the top museums in the world and I can see why. We were not allowed to take pictures inside the museum, but I've included a link above. The last stop was at the National Sun Yat-sen Memorial Hall. There wasn't too much to see here, just a statue of Sun Yat-sen and another changing of the guard. There was a great view of the Taipei 101 building from the courtyard however. This was the world's tallest building from 2004 to 2010. A building in Dubai is now taller. We were back at the ship before 2 pm. Tonight is the "meet your neighbors in the hall" night, so we'll get to find out who moved into the rooms around us in Hong Kong. We sail for Naha (Okinawa), Japan tonight so I probably won't be able to post again until the next day. As I said yesterday, Japan blocks the satellite channels we need to get internet.